Shock horror! Lord Pearson has claimed £100k in second home expenses that were not fraudulent and significantly less than most of the inhabitants of Westminster. Lord Pearson's main home is his estate in Scotland, his second home is in London. He says he spends almost exactly half the year there. The £100k is the total claimed since 2001 - £12.5k per year. This is significantly less than other peers and MPs, especially those based in Scotland. It turns out that these allowances were paid between April 2001 and June 2007, at a standard rate of £174 a night "for the purpose of attending sittings of the House". That works out at about £16,000 a year. Add the rest of the period and, in just over eight years, he has claimed £115,683 plus £56,685 subsistence – working out at about £20,000 a year. A typical MP over the same period, will have cost us about £1.8 million in salaries and expenses. It must be a slow news day at the Torygraph if they're already scraping the bottom of the barrel looking for some sleaze on Lord Pearson. Let me start by disappointing all those LibLabCon sheep who have been reading the "news" that UKIP is facing hundreds of resignations after Lord Pearson announced that UKIP had offered to stand aside for the Tories if they agreed to hold a referendum on the Lisbon Treaty/EU Constitution. There is no revolt in the party, there will be no wave of resignations. Lord Pearson, on the instructions of Nigel Farage, met with Lord Strathclyde (the Tory leader in the House of Lords) and told him that UKIP would not stand against the Tories in the next election if they agreed in writing to hold a referendum on the Lisbon Treaty/EU Constitution. The Tories declined to answer and of course we now know for sure what the answer was. The offer was made before the Czech president capitulated and there was still a possibility that we would enter the election next year without the Lisbon Treaty/EU Constitution ratified. The fact that the Tories wouldn't take UKIP up on the offer was a given. They were no more likely to commit to a referendum than the BNP to withdraw their policy of repatriating immigrants or the Greens to own up to the global warming scam. If the Tories had agreed to this deal then we would have had a referendum on leaving the European Empire because the Tories with a UKIP endorsement would be guaranteed a victory and the only way to rescind the Lisbon Treaty/EU Constitution is to leave the European Empire. The biggest threat to a Tory victory in the next election is UKIP. All those Tory hopefuls who are worried about their prospects at the general election know who to blame for the fact they still face a UKIP threat when they could have had a clear run at the lefties. Far from being an act of threachery, this should be seen as an astute piece of political manoeuvring. The Tory faithful have nobody but David Cameron to blame for the seats they will lose out on and the expected hung parliament thanks to UKIP. All he had to do was give a commitment to honour his "cast iron guarantee" to hold a referendum on the Lisbon Treaty. Telford & Wrekin UKIP are holding their annual Christmas dinner on the 7th of December at the Holiday Inn in Telford. Tickets are £20 and includes food and entertainment. For more details, contact wonkotsane@bloggers4ukip.org.uk. The votes have been counted, the results are in and Lord Pearson has been elected as Leader of UKIP. Lord Pearson came top with 47.7% of the vote, followed by Gerard Batten with 25.8%. Nikki Sinclaire came third with 12.2% of the vote with Mike Nattrass and Alan Wood finishing up with 11.0% and 3.2% respectively. Lord Pearson's victory was hardly a surprise as he was the leading candidate throughout but Nikki Sinclaire's third place was surprising as she was widely believed to have been in a close second place throughout. All five candidates ran an excellent campaign and some of the policies that were proposed during the campaign will no doubt be adopted under Lord Pearson's leadership. As with any change of leadership, there are members who are unhappy with the result. Lord Pearson's decision to make Islamification and immigration a key policy alongside leaving the European Empire, small government, flat rate tax and Swiss-style referrenda has been a bone of contention. It could prove to be a disastrous decision, leading to the party being branded as racist (more so than usual). Or it could be the making of the party, attracting disaffected voters who might otherwise have turned to the BNP. The fact that he is a peer is also a sticking point, particularly at a time UKIP is attracting Labour voters (and defections) in greater numbers. There is a suggestion that Labour voters will be put off UKIP by having an Etonian peer as leader of the party. It should be remembered, however, that there are more unelected peers in Gorodn Brown's cabinet than any cabinet in modern history and that Peter Mandelson is probably going to replace Gordon Brown as leader of the Labour Party after the next election. Constructive criticism of Lord Pearson, or any of the candidates, is a good thing but now is the time for the membership to give Lord Pearson a chance to prove himself as leader. If he turns out to be a terrible leader then he'll soon be out on his ear but let's not put the cart before the horse. North Korean border, you get 12 years' hard labour. Iranian border, you are detained indefinitely. Afghan border, you get shot. Saudi Arabian border, you will be jailed. Chinese border, you may never be heard from again. Russian border, you will be branded a spy and your fate will be sealed. Cuban border, you will be thrown into political prison to rot. All power to Lord Pearson, new leader of UKIP! Anonymous is an author at Bloggers4UKIP. Where, where, where, where's Danny? Daniel Hannan MEP, the great scurge of the European Empire and the sole hope of eurosceptic Conservatives for a vaguely eurosceptic Tory voice in the European Conservatives and Reformists. I wanted to talk to Dan Hannan's office today about something other than UKIP but could only find an email address and two postal addresses and phone numbers in Belgium and France. So I phone Conservative Party HQ to get a number for his UK office only to find he doesn't have one. "MEPs are based in Belgium so they don't have UK offices". I pointed out that he represents about 5m people and the chances are, a lot of them aren't going to have access to email so how does one of his "constituents" get in touch with him if they need his help? The answer I got was that as I have access to email I should email him and ask for a UK contact. Genius. Danny boy talks like a eurosceptic but he's already gone native. UKIP MEPs have offices in the UK and spend most of their time in their "constituencies" and when they aren't in the country, they have a staffed office employing local people to field enquiries. Elf & Safety gone mad? Under new E.U. Guidelines issued this week, all children wishing to benefit from a visit by Santa this Christmas will be required to fill out an official application form. Traditional letters to Santa containing a wish-list of toys and games will no longer be sufficient, as risks to the personal safety of Father Christmas, his reindeer and assorted helpers have been identified by Brussels beauracrats. The Department for Christmas Compliance has also identified a lack of clarity as to how 'good' each child has been and therefore how many gifts they should be allowed to request. A spokesperson, Ms Ery Gutz, said: "Whilst we would not wish to prevent young persons from receiving the gifts to which they may feel entitled, it is our duty to ensure that the safety of Santa Claus is paramount and that fairness in the distribution of gifts is maintained. "The sheer scale of the Christmas Eve operation renders it inherently dangerous, and the added complication of chimneys, open fires and differing roof-heights, amongst other things, makes this one of the most hazardous projects that this department has ever had to oversee." 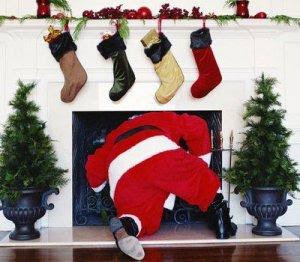 Despite no reports of Santa ever having been injured in the execution of his yuletide duties, failure to comply with the new regulations could see children left gift-less this Christmas. However, Ms Gutz's department have drawn up a contingency plan for those who do not complete the form: "Parents who do not wish to enforce their children's compliance can collect free stockings containing three walnuts and a satsuma, from any of our offices between the hours of 6.00am and 7.15am on Sundays between now and Christmas Day." Download an Application Form for a Santa Visit here. The sockpuppet Electoral Commission have told the Lib Dims that they can keep the £2.4m of stolen money donated to them by a convicted fraudster via an investment company he owned that doesn't trade in the UK. The Lib Dims won't have to pay back the stolen money illegally donated to them because the Electoral Commission said that they acted in good faith and that the company, despite all the evidence to the contrary, fits the criteria of being registered trading in the UK. Contrast this decision - being allowed to keep £2.4m of stolen money from a convicted fraudster - with the decision to confiscate £350k from UKIP because the donor, Alan Bown, was mysteriously taken off the electoral register without his knowledge at the time despite a judge having ruled that it was a genuine mistake and ordering UKIP to repay only a token amount of the donations. The real mission of the Electoral Commission is not to regulate and reform the electoral process, but to maintain the pro-EU LibLabCon status quo. UKIP has launched a petition calling for a referendum on our continued membership of the European Empire. Ignoring the fact that the petition says Great Britain when it should say United Kingdom (another of my pet hates!) it's one worth signing. This petition is going to be a big one, a lot of resources are being put into it. The chairman of the UK Independence Party has said the party will consider an alliance with Jim Allister's TUV in future elections. 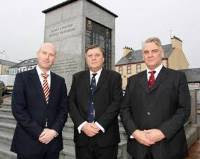 Paul Nuttall, UKIP MEP for the North West of England, was speaking to the News Letter yesterday after a low-key exploratory visit to the Province. UKIP has only one politician in Northern Ireland at present — Kilkeel councillor Henry Reilly, who defected from the UUP. Mr Nuttall described TUV leader Jim Allister as “a good guy” who worked closely with UKIP in Europe when an MEP. “The reason we didn’t stand here in the last European election was to give Jim a free run,” he said, adding that UKIP “will explore” the possibility of an alliance with him in the future. They haven’t selected anyone to stand in next year’s General Election here, with this visit being to “put out feelers”. But UKIP is now beginning to take Northern Ireland “very seriously”. Mr Allister told the News Letter that his party would not be “slamming any doors” on the suggestion. “Obviously I knew quite a lot of UKIP MEPs in Europe and had good working relationships with them on the big issues,” he said. On Wednesday, Mr Nuttall met with students at Queen’s University and he said that the response was so positive that the party planned to set up a group there. “We think there is a huge gap for a non-sectarian, pro-British party in Northern Ireland that believes in independence from the European Union,” he said, adding that the DUP have not voted on an EU referendum and are “not performing” in government while slating the Tories for backing out of promises for a referendum on the Lisbon Treaty. The European Empire said it wanted an EU President that could stop traffic in foreign cities. They chose Herman van Rompuy. What do you mean you don't know who he is? He's the prime minister of Belgium of course, whose greatest achievement thus far is managing to stay in the job for nearly 12 months (a real achievement for a Belgian prime minister this last couple of years). A real political heavyweight. And then there's the EU Foreign Minister, who also serves as deputy president. They naturally wanted someone with a bit of pizazz, a natural world leader known and respected around the world. So it won't come as a surprise to learn that they have given that job to Baroness Ashton. You mean you haven't heard of Baroness Ashton either? She was an official of the left wing wannabe terrorist group CND before being given a pretend peerage by Tony Bliar in 1999 for services to the Liebour Party. She then went on to be Leader of the House of Lords before No Mandate Brown handed her over to the EU to be the UK's EU Commissioner who then made her the EU Trade Commissioner. She has never stood for election in her entire political career. Pointless people appointed to pointless jobs for a pointless criminal organisation. The sooner we are out of this mess the better. Come the revolution, Baroness Ashton's treason will make sure she's one of the first against the wall. The mild irritation caused by the British government and the European Empire calling the EU "Europe" finally reached tipping point the other day. Europe Minister? No, EU Minister. European Commission? No, EU Commission. European Parliament? No, EU Parliament. European president? No, EU president. The Europe Minister isn't responsible for British government policy for the whole of Europe, just for the EU. The European Parliament isn't a parliament for the whole of Europe, just the EU. This irritating conflation of "Europe" and "EU" has prompted the first Bloggers4UKIP Number 10 petition: stop referring to the EU as "Europe". THE former Mayor of Redditch is set to stand against former Home Secretary Jacqui Smith at the next general election. 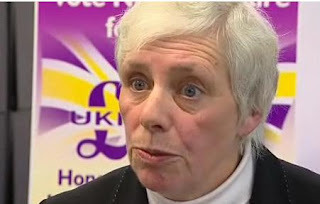 Anne Davis, who served on Redditch Borough Council for 12 years, will stand for the United Kingdom Independence Party in the election after defecting from Labour. Anne who used to sit on the same committees as Jacqui said: “Over the years, I’ve come to the conclusion that the party I supported no longer looked after the people of this country or this town, so I took the decision to resign from the Labour Party. I want to serve the people of Redditch in the same way as I did when on the council but I want to do it as a member of the UK Independence Party. It seems that is the view of Nigel Farage, UKIP's out going Leader. In an astonishing outburst of the BBC's Daily Politics Show on Wednesday this week he effectively dismissed all the other candidates despite three of them being MEP's and the fourth being a highly regarded and extremely knowledgeable South West Committee Chairman and UKIP Returning Officer. This author for one was quite frankly shocked at the comments which would have been problematic in a UKIP meeting, but to say such a thing on National Television, has re-ignited the debate as to whether UKIP is indeed a one man party. UKIP Constitutional experts have said Nigel has blatantly breached party rules, but it seems no one in a senior position is prepared to speak out against him. The other candidates would rightly feel let down, and perhaps very deflated as being branded effectively useless by the man they would, if elected have to work with. Three will still have to work with him in the European Union. In the interests of the party it is my view that Nigel should apologise not only to the candidates but to the membership. The comments on the UKIP members forum, is very much reflected by those in the general membership I have spoken to. This was an appalling gaff, that the party can do without. The Albion Alliance was launched today, to bring together people from all parties who want a referendum on the EU. Numerous opinion polls tell us that 70% of the voting public want a referendum on the EU. Over the past 40 years Britain has been led, against the wishes of its people, into a political union by a discredited political elite without so much as a single vote on the issue from the public. The last time the public were consulted, in 1975, it was for a simple trading partnership called the EEC. No-one has agreed to a political union where the law of this land will be made by unelected officials in a far off land. In order to force this issue to the top of the agenda, not in another 5 years, but as a priority for any incoming government, we will be asking every PPC to unreservedly commit to putting the country before party by signing up to the principles laid out in this Albion Alliance. We are not asking any PPC to abandon his or her own party, nor to set up a party in opposition, but to simply put the people whose votes they are asking for, and their country, before all else, irrespective of the Party Whip. When they become a signatory to the Albion Alliance, they are pledging to force this referendum, they will be asked to carry the Albion Alliance logo on their campaign website and literature, so that you the voter will know that if you vote for this candidate, they have pledged to granting the public that all important voice on the future of these Islands, a United Kingdom, a land once known as Albion. The public will then know when they are making that all important decision on who to vote for, a vote for a PPC who is pledged to the Albion Alliance means a candidate who is committed to a referendum, where we hope to find a majority of A.A. MP’s across all political parties once the election is over. Such an alliance would also consider policies that are likewise mutually compatable and can be agreed with the members. I have already made that pledge, and I urge you to write to your current MP, and then to all the PPC’s intending to stand for election in your constituency urging them to make the pledge to the A.A., The Albion Alliance. UKIP MEP Mike Nattrass says Tory leader David Cameron has failed the British people after withdrawing his ‘cast iron’ commitment to hold a referendum on the Lisbon Treaty. The UKIP West Midlands MEP says Mr Cameron’s u-turn shows the Tories are committed to the European Union and the signing away of our country. “It is clear from the Tories’ u-turn that the party is in disarray over Europe and their decision over the referendum shows the vast majority of its MPs and MEPs are euro federalists,” said Mr Nattrass. “Mr Cameron has also spoken about a UK sovereignty bill. This is meaningless spin as the UK is bound by acquis communautaire, which includes treaties, regulations and directives passed by the EU and also laws of the European Court of Justice. The Lisbon Treaty is therefore, ‘self amending’ and the UK will have no further say. “The Tories have conned the British people. UKIP is the only party exposing the EU and is committed to withdrawing Britain from the European Union. “Laws should be made in Westminster and not in Brussels. It is time to say No to the EU and pull out of the European Union,” he added. Gerard Batten, speaking in the company of the 5th November Old Holborn conspirators, says the Tories betrayed Britain even before it came to power. We the undersigned petition the Prime Minister to stop referring to the EU as "Europe". The European Union (EU) is not Europe. Europe is a continent containing many countries, most of which are in the EU. The EU does not cover the whole continent, it does not represent the whole of the continent and the British Government's Europe Minister doesn't form policy on the whole continent of Europe. The Prime Minister, the British government and the EU itself should stop claiming the whole continent for the EU. The EU should not be referred to as "Europe" and the Europe Minister should be called the EU Minister. Similarly, the European Court of Justice and European Court of Human Rights should be known as the EU Court of Justice and the EU Court of Human Rights. The Prime Minister should issue guidance on the use of the word "Europe", rename the Europe Minister to the EU Minister and petition the EU to name their institutions appropriately. Paul Nuttall, UKIP's party chairman, has resigned from the post with effect from the election of the new party leader. Paul was elected as an MEP for the North West of England euroregion and wants to concentrate on representing his constituents. UKIP MEPs are busier than most MEPs - not only are they working hard to try and make themselves and their colleageus redundant, but they also take their "constituency" duties seriously and spend an inordinate amount of time looking after the people that elected them. Mr Nuttall said: “The most important thing in UKIP is the relationship between the leader and the chairman, and Nigel and I have had the best relationship you can imagine. We’ve been the most successful team the party has had. “When a new leader comes in, they have the power to select the new chairman, and so I’ve decided to stand down to give them that chance. Bloggers4UKIP : Speaking of which, the ballot papers have been sent out for the leadership election. If you haven't received yours in the next few days, be sure to get in touch with UKIP HQ. Daniel Hannan, last of the eurosceptic Tory MEPs, has resigned from the front bench following David Camoron's pathetic betrayal of his party and the electorate of the promised Lisbon Treaty referendum. And you think you're going to get that with the Conservatives Danny boy? Not a chance. But you know that don't you? Dan Hannan is very good at saying what he thinks people want to hear. I suspect he's after a Boris-style "promotion" to a cushy job which is what tends to happen to members that are too popular to sack but persistently off message. Norfolk farmer turned MEP, Stuart Agnew has described David Cameron's decision to withdraw the 'cast iron' commmitment he gave to a referendum on the Lisbon Treaty, as a "betrayal" of Britain and has accused the Tory leader of producing a "meaningless wish list" that is completely unrealistic. Mr Agnew, who is one of the UKIP MEPs for the East of England said: "Mr Cameron has effectively allowed the President of the Czech Republic to decide the future of our country. His meek acceptance of the Lisbon Treaty following President Klaus becoming a signatory, is a betrayal not just of our country but of the many who voted for the Conservatives in June's European Election, believing them to be an EU-sceptic Party on the strength of their reform of the EU platform. "As for his so-called future plans, they amount to a meaningless wish list which sounds good but has absolutely no grounding in reality. Mr Cameron in all his talk of a UK sovereignty bill, a referendum lock and trying to get powers back has forgotten that the European Court of Justice was created to ensure that member states implement the laws created by the unelected European Commission and would challenge his plans. He has also forgotten or does not understand that the EU has a rigid structure of treaties that cannot be unpicked and an acquis communautaire - a law book, to which all member states are bound. If David Cameron were on a cricket field, would he seriously expect the umpires to accept the proposition that Tory batsmen are exempt from the LBW rule?!! "In his remarks today, Mr Cameron has clearly demonstrated that he will do absolutely nothing to rock the EU boat and that his Party is firmly committed to membership of the European Union, in perpetuity. There can be no further doubt that a vote for the Conservative Party is a vote for more Europe and more outside interference in the way our country is governed." Cameron's probably undergoing an excruciating learning process - one where trust is earned, not learned. 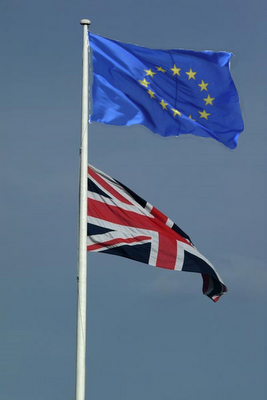 Benedict Brogan posts a cogent analysis on why we must demand a referendum on the EU. One would hope that politicians have learned that semantic games backfire. Why can they not simply be straight with us? The answer is obvious. They have too much to hide. They serve more than one master and when the inevitable conflict of interest arises, they have no choice but to fudge or lie. They become emboldened with each lie/fudge that pays off, but eventually, the electorate cottons on and an almighty boil builds. Sensible, integrity-steeped politicians will recognise the building boil and will seek to lance it. These wonderful souls (Dan Hannan) are, of course, ignored. Until they resign and thence, lance the boil. Then, the very subjects which the politicos wished to avoid discussing, become the very subjects which the electorate most want discussed. Knowing that they have lost the argument on the big issues that concern the electorate, they try to buy us off with concessions on minor issues. Avoid 'difficult' issues at all costs. And so, debate is denied, lying becomes entrenched. My mother warned that the danger of a lie is that one had to be able to recall ones previous lies to be credible. The real danger of lying is that the web of lies that invariably ensues, entraps us and forces us to face that which we sought to avoid - magnified. Integrity is in vogue, but our politicos appear to be the only people in the nation who don't know it. Apart from UKIP, that is. David Camoron says the Tories will introduce a British Sovereignty Bill to guarantee (is that a "cast iron guarantee"?) the sovereignty of the British government and prevent any more powers going to the European Empire without a referendum. If there's a conflict between an EU power grab and the British Sovereignty Act then the EU Courts have primacy over the UK "Supreme" Court and who will the EU's courts rule in favour of? And when will Dave be asking for his "election manifesto" to renegotiate powers from the European Empire and introducing his British Sovereignty Bill? Not the election next year, it will be in the Conservative Party manifesto for the election in 6 years time! How much power do you think the European Empire will have accumulated by 2015 and what are the chances of their still being a British government to have elections for? He must think we're all mugs. In the last week or two, the European Empire has ordered the break-up of Northern Rock, Lloyds and Royal Bank of Scotland. Before the UK Treasury could bail out UK banks, they first had to get the permission of the European Empire and then ask the European Empire how much they could lend the banks and on what terms. The terms were that the big banks would be consolidated and then forced to break themselves up into smaller units with a narrow focus that would destroy the UK's world-leading financial sector (despite the recession, London is still the centre of the financial world) and leave them unable to compete on the world stage. The objective of the European Empire, for a long time, has been to destroy our economy so that our financial sector is dragged down to the level of insignificance and obscurity the rest of the European Empire enjoys. When the financial sector is permanently hobbled, the euro will be almost inevitable and if they do a really good hatchet job on the economy, we might find ourselves asking the European Empire for handouts instead of subsidising most of the continent as we have done for the last half a century. And with a new EU regulator for banking and finance, they have been handed the power to create an EU-wide financial sector. When you lose control of your economy, you have lost your sovereignty. Successive UK governments - Liebour and Conservative - have handed over so much control of our economy to the European Empire that the Chancellor has to ask for permission before he can save a bank from bankruptcy and is powerless to prevent the break-up of the banking groups that have made London the financial capital of the world. David Cameron's position on Europe is false and dangerous. Meanwhile, William Hague has confirmed that the Tories believe in a Federal Europe, the continued power-grab by the EU and the permanent loss of sovereignty to the European Empire. We won't be deciding on this policy [Europe] based on the activities of what is a fringe party. We'll decide on what is best for the country and what we really believe in. The real choice is between the failed government of Gordon Brown and a new government under David Cameron. Interesting choice of words there by William Hague. UKIP is the fourth largest domestic party in the UK, the second largest EU party in the UK and represents the views of the majority of the electorate who are eurosceptics. It is the LibLabCon that are on the fringe of politics, imposing their anti-democratic eurofederalism on an unwilling electorate. Michael Portillo told the BBC this morning that if he was David Camoron, he would be "relieved" that Lisbon has now been ratified and that he wouldn't have to worry about the European question any more. He went on to say that doesn't want referendum on any future EU treaty, making a mockery of the latest pronouncement from the Tories that they will forget about Lisbon and object to any future EU treaty instead. A spokewoman from Open Europe said there won't be any more treaties: "they won't make that mistake again". "And now today we find ourselves involved in another struggle, this time called a cold war. This cold war between great sovereign nations isn't really a new struggle at all. It is the oldest struggle of human kind, as old as man himself. This is a simple struggle between those of us who believe that man has the dignity and sacred right and the ability to choose and shape his own destiny and those who do not so believe. This irreconcilable conflict is between those who believe in the sanctity of individual freedom and those who believe in the supremacy of the state........Don't be deceived because you are not hearing the sound of gunfire, because even so you are fighting for your lives. And you're fighting against the best organized and the most capable enemy of freedom and of right and decency that has ever been abroad in the world...........This democracy of ours which sometimes we've treated so lightly, is more than ever a comfortable cloak, so let us not tear it asunder, for no man knows once it is destroyed where or when he will find its protective warmth again." "This democracy of ours which sometimes we've treated so lightly, is more than ever a comfortable cloak, so let us not tear it asunder, for no man knows once it is destroyed where or when he will find its protective warmth again........You and I are told we must choose between a left or right, but I suggest there is no such thing as a left or right. There is only an up or down. Up to man's age-old dream--the maximum of individual freedom consistent with order -- or down to the ant heap of totalitarianism. Regardless of their sincerity, their humanitarian motives, those who would sacrifice freedom for security have embarked on this downward path. Plutarch warned, "The real destroyer of the liberties of the people is he who spreads among them bounties, donations and benefits." "But let’s not be so naive as to think we are witnessing a mass conversion to the principles of conservatism. Once sworn into office, the victors revert[ed] to type. In their view, apparently, the ends justified the means." Relevant to our agreement to join what was then the Common Market: "In 1972 the people of this country had a clear-cut choice, based on the issues -- to a greater extent than any election in half a century. In overwhelming numbers they ignored party labels, not so much to vote for a man or even a policy as to repudiate a philosophy. In doing so they repudiated that final step into the welfare state -- that call for the confiscation and redistribution of their earnings on a scale far greater than what we now have. They repudiated the abandonment of national honor and a weakening of this nation's ability to protect itself." "Our moment has arrived. We stand together shoulder to shoulder in the thickest of the fight. If we carry the day and turn the tide, we can hope that as long as men speak of freedom and those who have protected it, they will remember us, and they will say, "Here were the brave and here their place of honor." "An evangelical minister and a politician arrived at Heaven's gate one day together. And St. Peter, after doing all the necessary formalities, took them in hand to show them where their quarters would be. And he took them to a small, single room with a bed, a chair, and a table and said this was for the clergyman. And the politician was a little worried about what might be in store for him. And he couldn't believe it then when St. Peter stopped in front of a beautiful mansion with lovely grounds, many servants, and told him that these would be his quarters. And he couldn't help but ask, he said, "But wait, how -- there's something wrong -- how do I get this mansion while that good and holy man only gets a single room?" And St. Peter said, "You have to understand how things are up here. We've got thousands and thousands of clergy. You're the first politician who ever made it." "The British people know that, given strong leadership, time, and a little bit of hope, the forces of good ultimately rally and triumph over evil. Here among you is the cradle of self-government, the Mother of Parliaments. Here is the enduring greatness of the British contribution to mankind, the great civilized ideas: individual liberty, representative government, and the rule of law under God..........During the dark days of the Second World War, when this island was incandescent with courage, Winston Churchill exclaimed about Britain's adversaries, "What kind of people do they think we are?" Well, Britain's adversaries found out what extraordinary people the British are. But all the democracies paid a terrible price for allowing the dictators to underestimate us. We dare not make that mistake again. So, let us ask ourselves, "What kind of people do we think we are?" And let us answer, "Free people, worthy of freedom and determined not only to remain so but to help others gain their freedom as well..............For the sake of peace and justice, let us move toward a world in which all people are at last free to determine their own destiny." "From time to time, we have been tempted to believe that society has become too complex to be managed by self-rule, that government by an elite group is superior to government for, by, and of the people. But if no one among us is capable of governing himself, then who among us has the capacity to govern someone else?" In the extracts above, I have tried to remind you of the words of one who was a great statesman - and would that we, in this country, had one today. Do go read more of the words of Ronald Reagan, which can be found here. Vaclav Klaus has signed the Lisbon Treaty, the Tories have broken their promise to hold a referendum. The only way is out. The only way is UKIP. 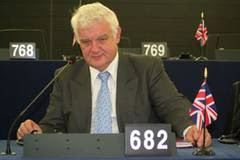 Mike Nattrass MEP speakss out against the EU plans for black boxes in cars. The MEP, who is a member of the European Union’s Transport and Tourism Committee, says plans by the EU for black box recorders to be installed in cars, are just a partial excuse to build an EU satellite system and will infringe people’s rights to privacy in their own vehicles. He said: "This is a very expensive justification for the EU's mega million euro Galilao satellite system which is designed to compete with the free American GPS system. "The EU will not use the American free system because the real objective of the EU system is precision bombing and GPS could be switched off by the Americans. So the EU team is thinking up alternative uses for Galilao! Road tolling will be next." A £2.4 million study commissioned by the EU, which is known as Project Veronica, recommends the mandatory installation of the boxes in all cars to record 20 types of data including vehicle speed and recent vehicle movements. But, Mr Nattrass says the boxes will be used as a tool or surveillance and will therefore affect people’s privacy. Privacy International is also critical of the proposals and claims such as device would act as an ‘infallible surveillance system’. Mr Nattrass added: “Of course safety on our roads is of paramount importance but these black boxes would be nothing more than a tool to spy on vehicle movements. “This is another example of EU interfering bureaucrats and their quest to change the UK. Recently they vetoed Britain’s wishes and allowed 60 ton foreign ‘mega lorries’ to roll onto our roads. “Now they want drivers on our roads to be spied on. We should be making our own laws in Westminster and not be dictated to by the EU. “It is time to say No to the EU and pull out of the European Union and UKIP is the only party committed to achieving that goal,” he added. Vote Derek Bennett Walsall South is an author at Bloggers4UKIP. Conservative Home has confirmed what we've been saying along - the Tories will not hold the referendum they promised on the Lisbon Treaty/EU Constitution. Today, I will give this cast-iron guarantee: If I become PM a Conservative government will hold a referendum on any EU treaty that emerges from these negotiations. ... isn't a "cast-iron guarantee" to hold a referendum on the EU treaty that emerged from the negotiations - namely the Lisbon Treaty. Montgomerie then goes on to say that David Camoron, having lied to his party, the Sun and the electorate by saying that he will hold a referendum on the Lisbon Treaty/EU Constitution when he has no intention of doing so, "deserves the continuing support of eurosceptics". On what basis? And this shows how findamentally dishonest David Camoron, the Tories and Conservative Home are. When the Lisbon Treaty/EU Constitution comes into force it is not possible to renegotiate our relationship with the European Empire. The British government will not be able to repatriate powers from the European Empire without the unanimous agreement of every member state. The Lisbon Treaty/EU Constitution introduces qualified majority voting - where we no longer have a veto - for a huge amount of policy areas. The Lisbon Treaty/EU Constitution is not a menu from which we can pick and choose the least damaging and costly clauses - it replaces the Treaty of Rome, the treaty that established the EEC (now the EU). It would be like Puerto Rico joining the United States and picking only half od the US constitution. The only way to renegotiate our relationship with the European Empire is to leave. But even if David "I don’t agree Britain would be better off by leaving the European Union" Camoron was forced into holding a referendum on leaving the European Empire it would still require the unanimous agreement of all member states before we could leave following a two year "cooling off period". I don’t agree Britain would be better off by leaving the European Union. Instead, we need to work within the EU to fight for change but on the question of referendums, I do want to see one on the EU Treaty because that’s what everyone was promised. The Conservative Party is campaigning very hard on just this. Other European leaders say the latest EU Treaty is a return of the constitution in all but name so whether or not he keeps the promise to hold the referendum is a real test for Gordon Brown. It will show whether he means what he says when he talks about restoring trust in government, and involving people more in decisions. Hoisted by his own petard. David Camoron promised a referendum on the Lisbon Treaty/EU Constiution and he has renaged on that promise. This was a real test for the man widely expected to be prime minister next year and he failed. In his own words, it shows that he doesn't mean what he says about restoring trust in government and involving people more in decisions. David Camoron is a fundamentally dishonest man, as is the Conservative and European Unionist party he leads. The vast majority of the Tory membership is opposed to the Lisbon treaty/EU Constitution, they are opposed to the European Empire and the wholesale transfer of our sovereignty to unelected eurocrats on the continent but they have been betrayed by their leader and his euofederalist colleagues. But don't have too much sympathy for the eurosceptic Tories who have lost their party to eurofederalist traitors - they have allowed it to happen and they allow it continue happening by continuing to support the party that has betrayed them. And people like Tim Montgomerie - collaborators with, and apologists for, the eurofederalist leadership - deserve no sympathy at all for losing the party they have worked so hard for. They sense that power is within their grasp and even though their party no longer represents their views, they will happily put their principles to one side and betray their country to be part of it. If the Conservative Party no longer represents your views (how could it?) then you have two options. You can either continue to support and vote for the Tories and allow yourself to be part of David Camoron's eurofederalist mandate or you can vote for a party that does represent your views, one that will withdraw this once great nation from the European Empire. That party is, of course, UKIP. Don't let yourself be conned into believing that you have to vote Conservative to stop Liebour or the Lib Dims from getting into power - why vote for someone you don't want to keep out someone else you don't want? Lesser of two evils? Don't make me laugh - there's barely a cigarette paper between Liebour and the Tories. David Camoron will never renegotiate our relationship with his beloved European Empire, the Tory policy of "reform from within" is a falacy. 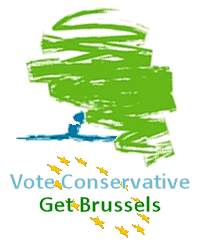 Vote Conservative, get Brussels. Vote UKIP, get our country back.